Medieval Mosques Illuminated by Math Historic buildings in the Islamic world are often covered with breathtakingly intricate geometric designs. Both artists and mathematicians have long puzzled over them, wondering how the patterns were created. A new study suggests the artisans worked from templates that drew upon advanced math principles. 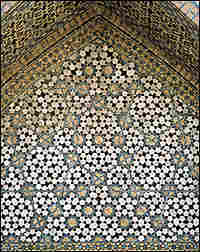 Complex patterns like this one, found in the archway of a Turkish mosque, were created by Islamic artisans in the 1400s. A reconstruction of this pattern appears below. 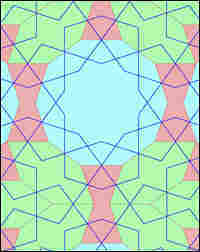 A computer reconstruction of a complex Islamic pattern. 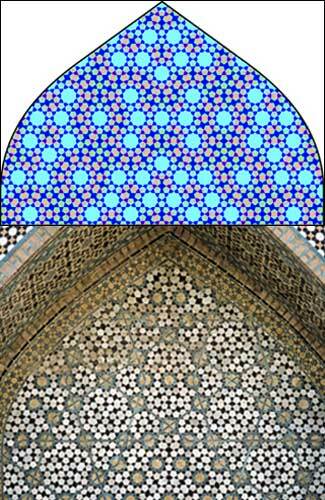 This artistic pattern at the Darb-i Imam shrine in Iran is actually a sophisticated mathematical pattern known as a quasicrystalline design. 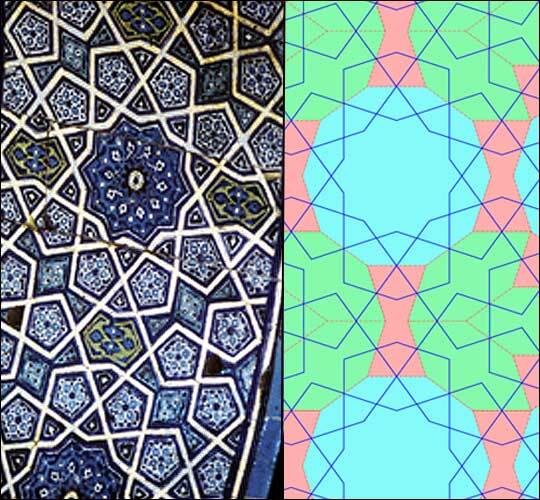 A new study suggests artists used templates to create these patterns. A reconstruction of this design appears below. 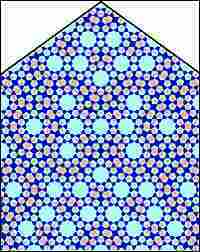 A computer reconstruction of the quasicrystalline patterns shown above. 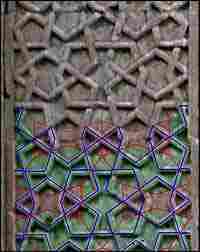 Medieval Islamic artisans had the ability to create nearly perfect quasicrystalline designs in the 15th century. 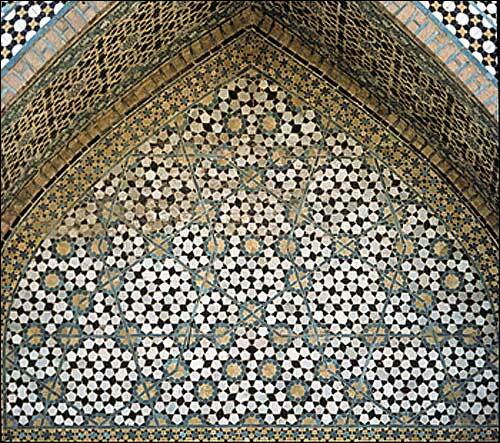 Historic buildings in the Islamic world are often covered with breathtakingly intricate geometric designs. Both artists and mathematicians have long puzzled over them, wondering how the patterns were created. Now, a Harvard physicist has some new ideas about the designs and the advanced math behind them. The research, conducted by Peter Lu of Harvard University and Paul Steinhardt of Princeton University, appears in the journal Science. 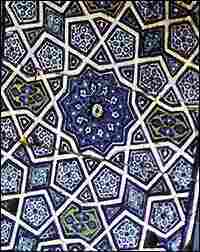 Several years ago in Uzbekistan, Lu came across a beautiful geometric design on the wall of a madrassa. The blue design with 10-pointed stars reminded Lu, a physics graduate student, of something he had studied in school – a strange crystal structure that was first described 30 years ago. Lu wondered, could Islamic artists have known about this weird geometry, 500 years earlier? To find out, he consulted a rare 15th century scroll – an instruction manual of sorts – for medieval artists, who carefully guarded their secret techniques. The scroll's panels show the bare outlines of different patterns. "Looking through these panels," Lu says, "I saw a bunch of five-fold pentagons, 10-fold stars." Lu saw that, in addition to the black outlines, there were some faint red marks in five shapes. He realized they were basic building blocks, templates used by the artists. Lu describes the templates as a set of "universal puzzle pieces." He thinks they may have been assembled to build different types of tile patterns. Once artists had these building blocks, Lu says, they could start drawing increasingly sophisticated patterns. In at least one case, the artists generated the kind of advanced mathematical pattern he had remembered studying in school. 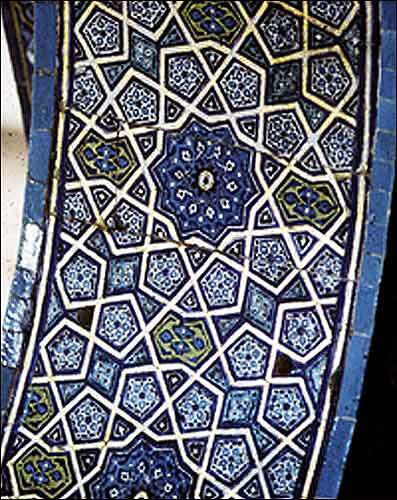 The pattern appears over an archway at the Darb-i Imam shrine in Iran. There are silver stars surrounded by black and gold shapes. In his study, Lu shows that the pattern has all the hallmarks of what mathematicians call a quasicrystal. Paul Steinhardt is a physicist at Princeton University who worked with Lu. He coined the term quasicrystal two decades ago. When some people first look at a quasicrystal pattern, Steinhardt says, they immediately notice repeating motifs. These people assume the pattern is repeating in a regular way, like the tiles on a bathroom floor. Others see that the pattern repeats but not in a regular way, and they assume that it is random. In fact, the pattern isn't random. Steinhardt says if you do the math, you see that it all fits together in predictable way. But intuitively, it's hard for some people to see. "It is hard to picture," he says, "and it's hard for humans to process these patterns and interpret them." Which raises the question of whether the medieval artists really understood the math behind their creation. Some scientists are skeptical. Craig Kaplan, a computer scientist who studies star patterns made by Islamic architects, says that it has not yet been proven that medieval artisans understood the mathematics of their intricate designs. "That is a much stronger claim and that would be much more difficult to establish," he says. "We know that they were good mathematicians, we know that they studied Euclid, but we don't know exactly how they worked." Today's scientists are still trying to figure out the secrets hidden in these geometric patterns. Kaplan says they are so appealing and mysterious that researchers will keep trying to unravel them, using all of the modern tools at their disposal.